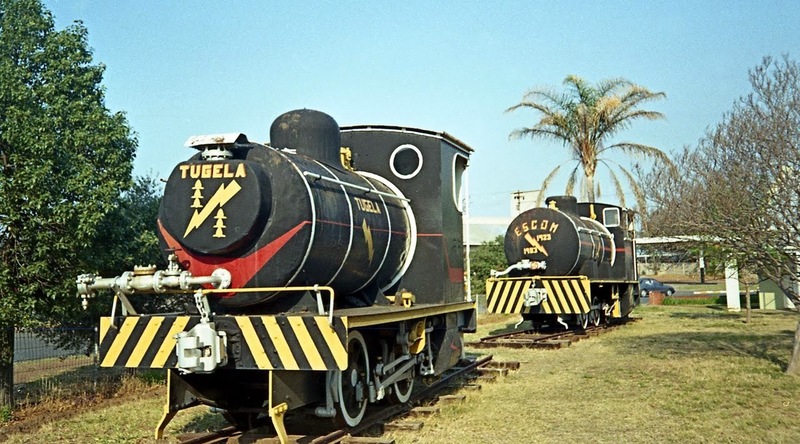 This image of the "TUGELA" and "ESCOM" fireless engines was taken in the 1980's by Phil Braithwaite at the Colenso Municipal Offices. This image taken by Jacobus Marais on 28 Sept 2011. It was posted to the Atlantic Rail fb page. 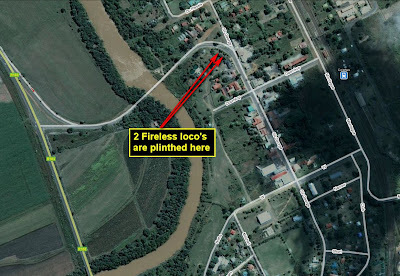 This March 2008 Google Earth Map shows the location of two fireless steam locomotives in Colenso. Click on Map to enlarge. 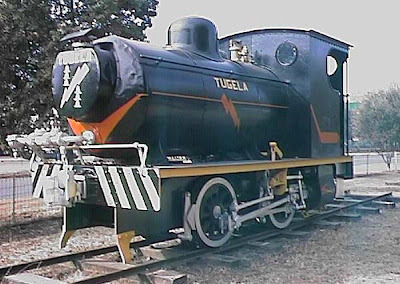 TUGELA is a fireless-type steam locomotive. This means that it has no boiler to generate steam. Instead, it has a large insulated pressure vessel holding steam under pressure. These locomotives were suitable for short trips in areas where large steam generating plants were available to recharge the pressure vessel. Trains hauling coal were brought by the railways to points near the power stations. Each power station was then responsible for the haulage of the coal trucks to its coal staiths. 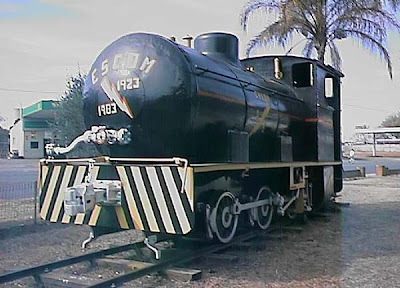 ESCOM is a fireless-type steam locomotive. This means that it has no boiler to generate steam. Instead, it has a large insulated pressure vessel holding steam under pressure. These locomotives were suitable for short trips in areas where large steam generating plants were available to recharge the pressure vessel. ESKOM, formerly known as the Electricity Supply Commission (ESCOM) was the second largest user of fireless locomotives in South Africa. The Iron and Steel Corporation (ISCOR) was the largest user of this type of locomotive. ESKOM employed fireless locomotives at its power stations for almost sixty years. ESCOM was obtained from W G Bagnall and Company Limited in 1937. 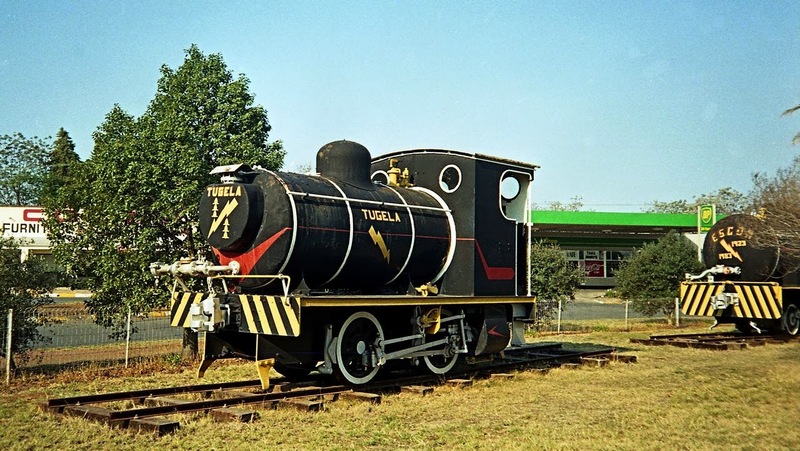 It served at Colenso power station until the station was closed in 1984. 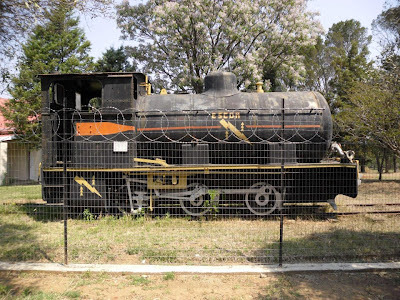 In 2000, it was still on display outside the municipal offices at Colenso in KwaZulu/Natal. This information on ESCOM locomotive comes from research material compiled by Mr. Rick Searle, a retired ESKOM employee.